Let Spanish charm lure you in. Treasured tradition meets the modern world as historical buildings sit by lively resorts. Flamenco-themed evenings are hosted near bustling bars and eateries. Lazy towns settle into an afternoon siesta, before tucking into tasty tapas in the evening glow. Spain's colourful mainland is complemented by glittering islands, creating an unbeatable team! Showing off alluring coastlines, striking architecture, fiery culture, quaint villages and culinary delights, it's a treat for any taste. You're sure to be hypnotised by its charismatic shine and sophisticated passion during your villa holiday in Spain. Such a famous name has a lot to live up to, and Mallorca definitely doesn't disappoint! In fact, we're certain it'll completely blow your expectations away! This Balearic superstar has tempted sun-seeking holidaymakers for years, and it's easy to see why. Sun-laden resorts glow with sandy beaches and sparkling seas. Dive into a haven of history in the capital of Palma, with its Gothic Cathedral adding a Gaudí touch. Mazes of shopping streets weave among flowing fountains and green gardens, mimicking Spain of old. Or if a day in nature sets your heart racing, witness the indescribable beauty of the Serra de Tramuntana mountain ranges. A scene so staggering they've been awarded the status of UNESCO World Heritage Site. Whether your Mallorca getaway is one of restful relaxation or awesome adventure, it'll go down in your holiday memory book for years to come. Ibiza pleasantly contradicts its party-scene image with hidden coves and old-fashioned villages. Let this little island surprise you with its untouched charm and tranquil pockets. Its Old Town is an image of a turquoise harbour against a backdrop of colourful buildings – a glimpse into the island's rich heritage. Head inland to rural hideaways or venture to Parc Natural de Ses Salines for visions of reflective salt flats – a dazzling stretch of sea connecting the mainland with Formentera. Let Ibiza satisfy your curious mind with a villa holiday of rural exploration and peaceful bliss. 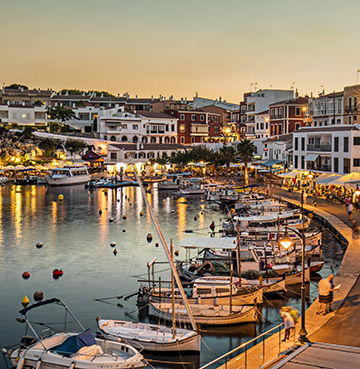 Menorca's heartbeat sings to its own tranquil notes. With a quaint rhythm and quiet nature compared to its livelier Balearic sisters. Glorious beaches hug the coastline, overlooked by rugged rocky coves. During your idyllic villa holiday, visit the typically Spanish towns of Mahon and Ciutadella, cherished areas where streets glow with an untouched, well-loved feel. Stretch your legs along the Cami de Cavalls and you could be enjoying some of the finest views. This coastal path artistically outlines the island. 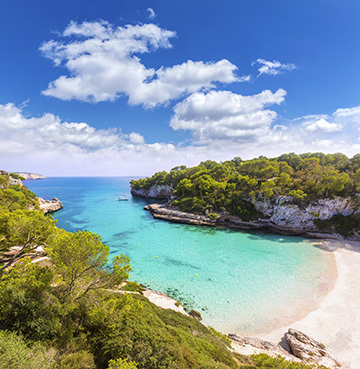 Menorca wears its Mediterranean heart on its sleeve – so allow yourself to fall in love with its charm and gorgeous nature. Stunning coastal shores? Tick! Spectacular volcanic terrain? Check. Waterparks, golf courses, whale watching? Absolutely! 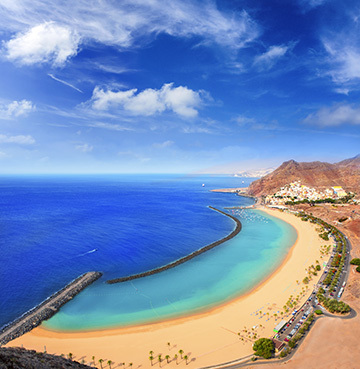 Picture holiday bliss on this glittering Canary island with everything you could wish for. The north of the island is strewn with lush greenery, merging into the staggering Teide National Park. The south glistens with tempting shores, perfect for those lazy days in the sun. Head to Siam Park for water thrills and spills – amazing family fun awaits! Enjoy endless possibilities for holiday adventure and tranquillity in Tenerife. Dramatic coastline meets rugged volcanic lands on this Canarian superstar. Perhaps you'll head to a stunning shore to bask on the golden sands of Lanzarote, or does an active holiday tickle your fancy? You'll be spoilt for choice with natural sights and walking routes aplenty. Visit the volcanic wonder of Timanfaya National Park, where extraordinary experiences await. Delve into the intriguing lava fields or head north to take in the breathtaking views at Mirador Del Rio. Lanzarote offers waves of possibility to discover and explore during your villa holiday in Spain. Fondly known as 'a continent in miniature', Gran Canaria boasts diverse terrain stretching from the coast towards inland hillsides and vast desert. It may be famous for its lively resorts, but there's much more to discover beyond those golden sands. Challenge your inner thrillseeker to hiking, cycling and watersport adventures. Or spend your days admiring the idyllic beach landscapes before immersing yourself in the island's thriving nightlife. With annual average temperatures of 24°C, this is your year-round holiday haven. 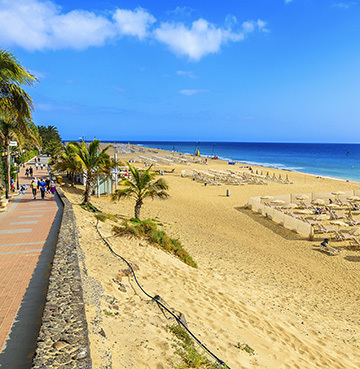 Fuerteventura dazzles visitors with its shining coastline, sprinkling of striking volcanoes and glowing characteristic villages. El Cotillo is a true gem. A white sandy beach sits next to tempting eateries and a picturesque harbour. Just 25 minutes from Corralejo, it makes for an idyllic day trip. Caleta de Fuste attracts families with its tempting golden sands and thrilling watersports. A laidback vibe blesses this diverse sun-kissed island, giving Fuerteventura its year-round lure. Authentic Spain awaits in Andalucia. Embracing a true traditional feel, with Moorish buildings standing tall among rustic architecture. Little white villages are dotted along hillsides full of green olive groves. Here, you'll be wrapped in Spanish warmth and culture. 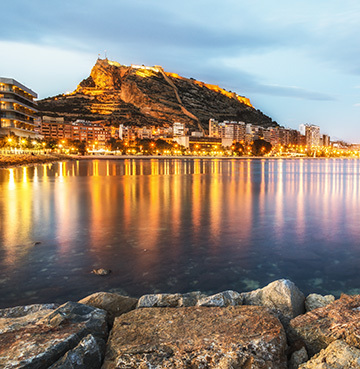 Enjoy lazy days at some of the best beaches in Europe, including the Costa Del Sol and Almeria. Taste local delicacies and sip on sherry as lively fiestas meet flamenco – a powerful pairing for memorable evenings. Spirited Spain is all yours with a visit to this coastal masterpiece. Close your eyes and picture your perfect day on holiday. If you can hear soothing sea sounds and feel a golden glow on your skin, then Costa Blanca is for you. This bustling Spanish superstar is teeming with idyllic shores. Unwind on the beach by day and relax with a cooling drink by night. Pure bliss awaits in the warm evening sun. Costa Blanca's charm will leave you with lasting memories and an urge to return! A rugged skyline of traditional Spanish housing sits along unspoilt rocky bays, looking out to inviting Mediterranean waters. 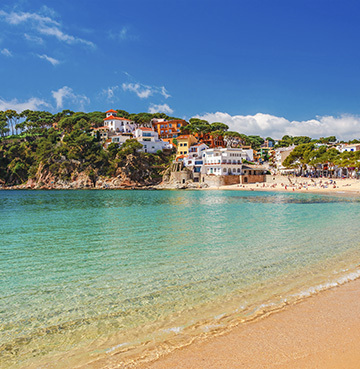 Costa Brava proudly boasts Blue Flag shores. It's truly an irresistible choice! Tempting restaurants and cafés sit in year-round balmy temperatures. If you have an urge to discover natural wonders or spend time soaking up the warmth, jet off to Costa Brava for a heavenly holiday in your secluded Spanish villa. Costa Calida is another jewel in Spain's coastal crown, sizzling in summer heat and glowing from winter sun. Home to many thrilling watersports, it's full of exciting possibilities for those adrenaline adventurers. If you fancy a more laidback getaway, you're sure to find a peaceful sandy beach to top up your tan. Fertile lands produce some mouth-watering temptations and inspire local chefs' creativity with flavours and spices galore. Let your senses tingle with the tastes of tapas! As the saying goes – 'the rain in Spain falls mainly on the plane'. This is certainly true here! Costa Dorada's coastline glistens in non-stop sunshine. Azure seas and stunning mountain ranges are complemented by untouched rural lands. Traditional towns ooze a sense of history from the 14th century, whisking your imagination away! Let the golden serenity of pure Spanish bliss allow you to unwind. An unforgettable villa holiday in Costa Dorada awaits.